Well, last day of September and cause for a little modest celebration here on ATW. Why? Well, this month has set a few records, that’s why! 1. September has seen 417 posts on ATW, the biggest amount of fresh material ever. How many other blogs can sustain this? 2. September has seen site traffic reach a new HIGH for 2009, and that is (despite) the moderation. The number of unique individuals coming here is at a peak. I don’t care for blog awards, I only really care about you coming here and more of you are doing that than ever. So I’m pleased about that. Next month will be more challenging. I am going to be away from the site from 23rd October and won’t be back until the end of the first week in November. Of course I might pop by but I will be relying on the ATW team to keep the flag flying in my absence. Thanks again for visiting here and as we segue into October, here is to keeping this site topical, lively, courteous (in the main!!) and somewhere worth coming on a daily basis. I read that Nottingham is to become the first city in England and Wales to introduce a total ban on drinking alcohol in public. Drinking in the street will be barred under new Government laws due to come into force next year, and if the new ban is approved, it will be outlawed from all streets, parks and other public places. What do you think of this? I believe it is an outrage and a further expansion of power from the State. My but what a big surprise. The UN’s chief weapons inspector, Mohamed ElBaradei, said today he had seen “no credible evidence” that Iran is developing nuclear weapons, rejecting British intelligence allegations that a weapons programme has been going on for at least four years. Fair enough. 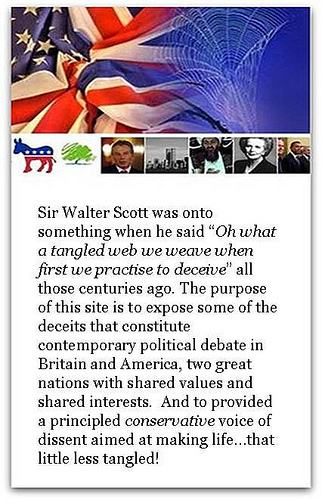 So, it all depends on who you trust most – Mohamed or Britain. Subrosa has an interesting post here on the issue of Gordon Brown’s declaration that his government will provide a network of supervised homes for 16-17 year old mothers. The question posed is WHY have abortions spiralled upwards since 1967? This tells you all you need to know about the Prime Mentalist…watch the look at the end!!! YOU KNOW WHEN YOU’E BEEN TANGOED! Godd to see the sort of valued work in which the UN engages when it’s not bashing Israel. Perhaps when I am in New York in October it will glow red white and blue in my honour. OK, I admit I do despise Communism but I do like Chinese food so maybe that may swing it? I can but hope my fellow ATW colleagues have a word in the shell-like of those in (literally) high places and get those lights turned on. Have laugh at the fury which The Sun’s rejection of Labour has provoked. The curiosity is that if the Sun is as unimportant as the Labour attack dogs suggest, what are they so angry about? I see that an EU investigation into the roots of last August’s conflict has reserved its harshest criticism for Georgia’s military assault on the breakaway region of South Ossetia and its capital Tskhinvali. Crawling to Russia. I suppose the EU must find it hard to criticise the Russian tyrants. NO BNP IN THE STATE SECTOR? Ed Balls, UK Schools Secretary, has declared that he is going to stamp out “racism” in schools and that means potentially banning anyone who supports the BNP from teaching in our wonderful State schools. Why stop at the BNP? It seems to me that Islam has some pretty offensive view when it comes to the Jewish people so can we please ban all Muslims from teaching in our schools? I also think that those socialists who seem to loath white middle class British people should also be banned from teaching as their self loathing is pretty offensive. In fact, shall we ban everyone who has any political views from teaching? Could we just employ robots and sack what we currently have? Would the Unions prefer that? Then again, we could take the mature view that teaching is supposed to be a profession and ALL who work in it, right, left or centre, should keep their political opinions OUT of the class room? Nah, too radical.